God bless ‘Merica. Happy Fourth everyone! I’ll be celebrating today by overindulging in food and drink. There ain’t nuthin more ‘Merican than that. This country’s seen its up and downs. The ups are great. But the downs are equally as important. After all, what’s history worth if we can’t learn from it. Without further ado, I present to you four truly ‘Merican writing errors. 1. For a second there, Thomas Jefferson forgot the meaning of the word ‘independence’. There is perhaps no greater document in American history than the Declaration of Independence. But no one gets it right on the first draft. Turns out Mr. Jefferson’s original draft of this now legendary document referred to the future Americans as ‘subjects’. Luckily for us, he changed the word to ‘citizens’ — a term much more indicative of freedom. I know that he did not wish to have carried through from typescript to printed book his typing mistakes, misspellings (as opposed to coinages), faulty punctuation and accidental repetition. He depended on my predecessors, and later on me, to point out such errors and correct them; and though we never achieved anything like a perfect performance, we tried. And he wasn’t the only one. A quick look at some of Hemingway’s unedited correspondences shows the legend’s own problem with spelling and grammar. 3. The Chicago Tribune embarrasses itself in 1948 presidential election. Thomas Dewey went toe-to-toe with Harry Truman in the 1948 presidential election. 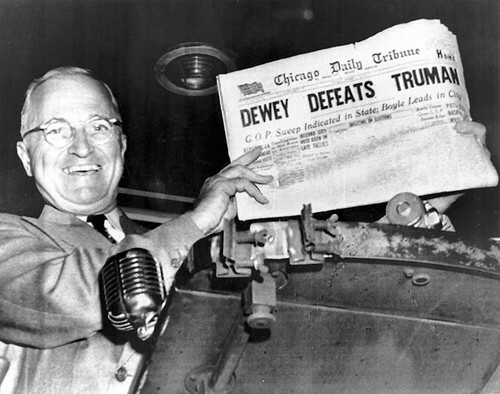 And the Chicago Tribune trusted the polls, falsely reporting that Dewey had won the election. In reality, Truman snagged victory from the jaws of defeat, permanently etching the Trib’s place on journalism’s Wall of Shame. Leave it to Truman to drop an atomic bomb on Dewey’s hopes and dreams. 4. T.S. Eliot plagiarized ‘The Waste Land’. It’s considered one of the greatest works of poetry in history. And it’s mostly plagiarized. Yep, turns out ‘The Waste Land’ is a waste of time. Of course, Eliot was eventually naturalized as a British citizen. But he was born an American, and so he makes our list.